Central Coast Chorale Presents Our Annual Holiday Concerts! 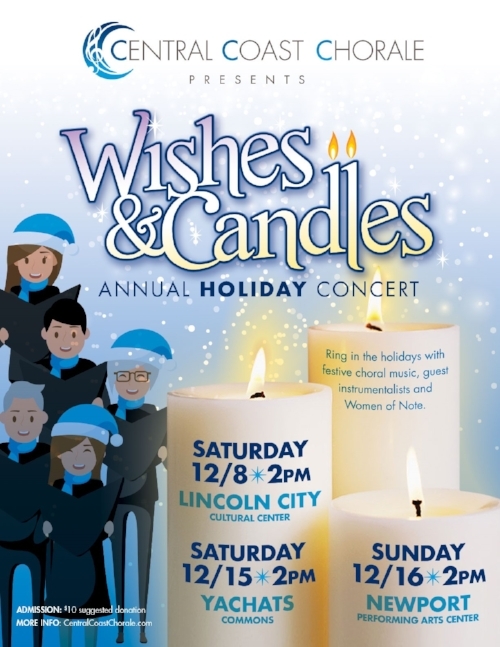 The Central Coast Chorale will be presenting our annual Wishes & Candles holiday concerts in December. The fifty-voice choir under the direction of Dr. Mary Lee Scoville will be kicking off the holiday season with a wonderful selection of Christmas music on Saturday, December 8th at the Lincoln City Cultural Center. The concert will be repeated on December 15th at the Commons in Yachats and then, on December 16th the Chorale will perform a special version of the concert at the Newport Performing Arts Center adding a small orchestra as accompaniment. All three concerts begin at 2 pm and have a suggested donation of $10 for admission. Since the choir started off their fall season participating in the Newport Symphony Orchestra’s very successful anniversary concert singing the famous Ode to Joy movement of Beethoven’s Ninth Symphony, they decided that this year’s holiday concerts should include somewhat lighter fare. This music selection has resulted in a mix of all the aspects of the Christmas season from awe to quiet reflection to joyous lightheartedness. Instead of some of the larger works of serious classical composers that have featured at previous concerts, the Chorale has chosen to focus on contemporary composers, folk tunes and fun. From the crystal clarity of the exquisite chords of Lux Aurumque by modern American composer Eric Whitacre to the quiet meditation of Morten Lauridsen’s Sure on This Shining Night concertgoers experience the magnificence of the season. The Wassail Song by Vaughn Williams and Gaudete, arranged by Brian Kay of the King’s Singers are both based on traditional English folk melodies and connect us to the history of the celebration. Folk tunes also bring us two other songs on the program, one from Africa, Jabula Jesu, and one from the Ukraine, Sleigh Bells. Both will remind the audience just how much fun Christmas and the winter season can be. The kids will surely enjoy these two. The highlight of the concert brings all these themes together in one piece. The words of a traditional carol get mashed up with a whole host of famous tunes that walk us through the history of music in A Musicological Journey through the Twelve Days of Christmas. When the orchestral accompaniment gets added to this piece at the Newport performance, it should be a true show stopper. The Central Coast Chorale’s small women’s group will, as usual, step out from the group to perform several songs, at least one with a recorder accompaniment from Eric Bigler. Women of Note will be performing a 17th century lullaby arranged by contemporary composer John Rutter that begins “sweet was the song the virgin sang.” They have programmed two madrigals to keep the mood festive for this concert. Throw Open Your Shutters is a high-energy original piece by Amy Feldman Bernon with some wonderful interplay between voices in a jaunty, staccato section where the singers imitate bells, “Hey! Ding-a-ding!" Christmas Madrigal ‘Roundezvous’ by Linda Spevacek-Avery is a sparkling, festive madrigal sung in the round. Yes, Roundezvous is an intentional misspelling. It exhorts “Prepare the song, the feast, the ball to welcome Merry Christmas all.” And continuing the merry theme of the concert, they have a very silly piece titled Fruitcake by Hagemann and Leka. Throughout this novelty song the ingredients for fruitcake are added one by one. The Central Coast Chorale was founded in 1997 by director Mary Lee Scoville and a group of local residents who wanted to enjoy singing in a convivial yet professional setting. The Chorale has since doubled in size and now can claim more than 50 voices. They draw singers from up and down the central coast, as far north as Neskowin and south to Yachats, welcoming new members in January and August. They present three to four concerts a year and pursue a mission of sharing quality choral music with the community. For more information see their website at centralcoastchorale.com or email admin@centralcoastchorale.com. What a great concert if we do say so ourselves! We had a full house yesterday for our annual holiday concert. The chorale sang eight pieces including For Unto Us a Child is Born from the Messiah, Still, Still, Still an Austrian carol arranged by Norman Luboff and a rousing rendition of Sing We Now of Christmas. Women of Note, our women's group sang five songs. My personal favorite was the Rutter What Sweeter Music. I think it really brought out the beautiful mix of voices that you can hear so clearly with just eight singers. The Oregon Coast Community College choir class, also directed by Mary Lee, did four pieces and then joined the chorale for the grand finale. It was wonderful to have them as guests. They did such a great job. We'd like to thank our director, Mary Lee, our wonderful accompanist, Milo, and all the people who came out to the concert on a rainy, blustery day. It's so much fun to sing for an appreciative audience. We love it and hope you did, too! Join us next weekend for a very different concert. We'll be performing Saturday evening and Sunday afternoon with the Newport Symphony Orchestra and the Corvallis Repertory Singers at the Holiday Spectacular Concert at the Newport Performing Arts Center. We'll be singing Lauridsen's Lux Aeterna and selections from the Bach Christmas Oratorio as well as a number of carols. So looking forward to the timpani in the Oratorio! We had a rehearsal in Corvallis on Saturday with our conductor for the event, Steve Zielke. Steve is the director of choral studies at OSU and founder and directory of the Corvallis Repertory Singers. It was a wonderful rehearsal and we learned a lot in a very short time. We think this is going to be a very exciting concert. Get your tickets before they sell out! Tickets available though the Oregon Council for the Arts website. Dr. Steven Zielke conducts rehearsal with the central coast chorale in preparation for holiday spectacular concert. Join the Central Coast Chorale as they welcome the holiday season with the Wishes and Candles concert. This annual event offers music both sacred and secular, contemporary and classical to celebrate the winter holidays. The First Presbyterian Church of Newport hosts the event on Sunday, December 6 at 2:00 in the afternoon. Suggested admission donation is $10. The Oregon Coast Community College Chorus and the vocal octet Women of Note will join the chorale for this performance. Several of the pieces will be performed a capella. Pianist Milo Graamans will accompany all others. The concert will open with an upbeat, richly textured African folk song “Jabula Jesu”. The Austrian carol “Still, Still, Still” is warmly familiar and offers striking contrast to Arvo Pärt’s minimalist “Bogoróditse Djévo.” Composer Philip Stopford’s arrangement of the traditional carol, “Lully, Lulla, Lullay” is simple with a haunting beauty that is sure to please audience members. Women of Note will sing a contemporary arrangement of the Latin traditional “Dona Nobis Pacem,” John Rutter’s “What Sweeter Music,” and a festive Christmas madrigal. “Wolfgang’s Christmas Canon” by Tom Fetke incorporates a traditional holiday song with a Mozart canon resulting in a bright and lively piece of music. They will close their set with “Ave Maria” by the 16th century master of polyphony, Palestrina. The First Presbyterian Church of Newport is located at 227 NE 12th Street. For more information call Chorale Director MaryLee Scoville at 541-563-6830. The Chorale will also be performing with the Newport Symphony Orchestra and the Corvallis Repertory Singers on both December 12 and 13 at the Newport Performing Arts Center. This Holiday Spectacular performance features Bach’s “Christmas Oratorio” and Morten Lauridsen’s “Lux Aeterna.” Call the PAC ticket office at 541-265-ARTS (2787) for more information and tickets.